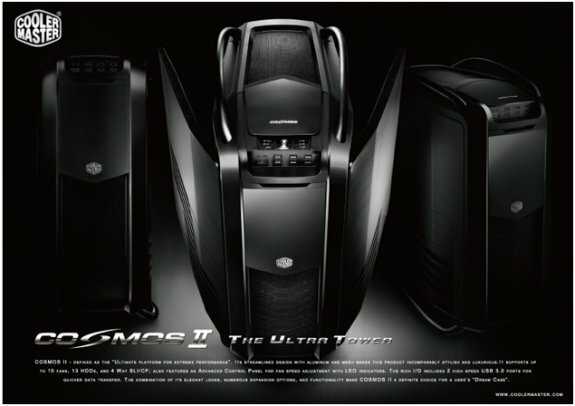 Cooler Master takes the wraps off its Cosmos II, a new high-end "Ultra Tower" case that will cost a whopping 350EUR! In its 20th year of service, Cooler Master, an industry leading chassis, thermal solution, power supply, peripheral, and accessory manufacturer, today announced the successor to a world renowned chassis line, the Cosmos II. Incomparable in design and specifications, the Cosmos II comes in as among the first of its type. It is an Ultra Tower; a benchmark for all enclosures that exist and all that follow. Inspired by luxurious supercars, the exterior of the Cosmos II melds aluminum, steel, and mesh into an elegant artistic piece. It utilizes a high-grade aluminum for its primary construction and form. This is supplemented by steel and mesh to add to strength, stability, and overall appeal. It maintains its trademark Cosmos profile and outlook with its reinforced aluminum rails while being further refined for today’s advancements in air/water cooling, peripheral support, and styling. Following the supercar feel, the large aluminum side panels swing wide open with a small press of a button. Aluminum sliding doors adorn the well equipped fan and LED control and I/O ports function panel on the top of the case along with the front drive bays. These serve to obscure unsightly cabling and protect drive bays and devices. A stock Cosmos II supports a 360mm radiator in the top. Removal of the bottom hard drive cages results in space for a 240mm radiator placed on its side; having direct access to cold air from the exterior of the case. Mounting support will vary based on the radiator manufacturer. Large single 120mm or 140mm All-in-one (AIO) water cooling units are supported on the rear exhaust fan port. A full twenty percent larger than its predecessor, Cosmos II can effortlessly hold up to 13 HDDs or SSDs (2 X-docks, mid-cage 5, bottom cages 6) and multiple water cooling radiators. The Cosmos II has 10+1 expansion slots that enable users to install systems from the highest end that include of up to 4-way SLI / Crossfire builds. The +1 expansion slot allows users to install add-on cards via PCI extensions, or install other function panels for CCFL / Cold Cathode lighting control, additional cooling, and much more. Users looking to build the most extreme systems will enjoy the fact that the Cosmos II motherboard tray easily accommodates up to a XL-ATX motherboard. A professional cable management look is possible with little effort. This is thanks to high quality grommets on the cable management holes and utilizing the many available cable tie zones. Smarter, and larger, placements of these areas allow for efficiently routing cables. A wide array of hardware can be mounted tool-free via the use of the included locking mechanisms, trays, and thumb screws. A very large CPU heat sink retention hole has been placed in the motherboard tray to allow it to be compatible with most types of CPU and motherboard layouts (Current LGA2011 and AMD FM1 sockets are supported). The included front panel connections and controls provide a user with the ability to make on-the-fly changes to fan speed and case LEDs while USB 3.0 and 2.0 ports, and audio connections are also provided as an added means of convenience. This is topped off by two HDD/SSD X-docks in two 5.25” bays. These make mounting extra drives as easy as loading a Blu-ray/DVD/CD. The Cosmos II will be available for €349.99 by the end of January, 2012. It will be available at retail and online locations that carry your favorite Cooler Master products.